The reality of my work / life balance: Which family do I choose? I had great plans for this half term. I was going to get back my work / life balance. My plan was simple: split the week in half. The first half was for me, except for an hour on Tuesday to work with my Y11s. I was totally drained after the previous 6 weeks and needed to recharge and get my brain working properly again. Then, I was going to work from Wednesday onwards (with Saturday off for the 6 Nations!) to catch up and get ready for going back to work. On Monday morning I was presented with the one thing that wouldn’t just cause an imbalance, but would totally destroy the scales of my work / life balance. With one family member in hospital, suddenly Schemes of Learning and marking seemed like minor inconveniences; a waste of my time & energy which needed to be pushed to one side. I’ve spent a lot of time this holiday driving back and forth to hospital; phoning the hospital; phoning various relatives and shopping for the essentials that my uncle needed. It wasn’t until Thursday that I began to think about work (a day later than planned, so behind before I even began) and found it really hard to concentrate. I was racked with a mixture of guilts. I felt guilty that I hadn’t been as focused on my exam classes (and I have 5 of them!) and marking as I should have been. Guilty that I couldn’t even remember what my TLR jobs were for this week. Guilty that I couldn’t do more to help my uncle. I felt like I was torn between two families. I love my family dearly and it genuinely pains me when I can’t help them or, worse still, don’t know how to help them. But I have invested so much time and energy into my GCSE & A Level classes that I truly care about them and their marks. The sad truth is that there have been times when I have given my students more time and thought than I have my own family and I’ve done it without a second thought. But it struck me that I was struggling more when it was the other way round, which just added on a whole heap more guilt. I’ve realised that it’s not that I care more about my students than my own family, but I have put so much of my time and so much of myself into their education that I’m invested on a level that non-teachers can’t grasp. It pains me when I have to deliver them a bad mark when they’ve worked so hard. I’m near delirious when they exceed their own, and sometimes my, expectations. I get hurt and disappointed when they let me down. Yet it dawns on me that I feel safe when I’m giving them my time: I am the expert. I have spent years training for this and even more years practicing it: I know what I’m doing. Yes, I have ‘teachers’ block’ and doubt myself at times but underneath it all I know what I’m doing and I know I’m doing it right. However, there was no uni course for dealing with family and family emergencies. I’ve had no practice at coping with and supporting an alcoholic. But it’s worse than that: I was unprepared for the reality of the uncle I’d idolised as a child. On Thursday I was getting down to school work, when I was rocked by a phone call. When I put the phone down I felt useless; I felt powerless; I felt confused. I couldn’t work: I couldn’t think straight. I needed my family, but with my parents living abroad and my other uncle at work I was stranded. I talked it through with my husband, but we couldn’t get close to the answer without every member of the family involved. Inevitably, the answer didn’t offer the magic solution or a ‘happily ever after’ like Hollywood would have us believe. It presented more problems; more feelings of uselessness and another day of stress. I have to say this though, Thursday evening I felt at my lowest over the whole situation and sent out a tweet: “In need of cheering up tonight. C’mon Twitter, do your thang!” I rarely send out things like this, but I was genuinely cheered up by the people who responded. It struck me that 6 people, who I’ve never met in ‘real life’ took the time to cheer me up. They gave me the strength to pick myself back up and get on with it. And I’m still riding off that today (and the England win). 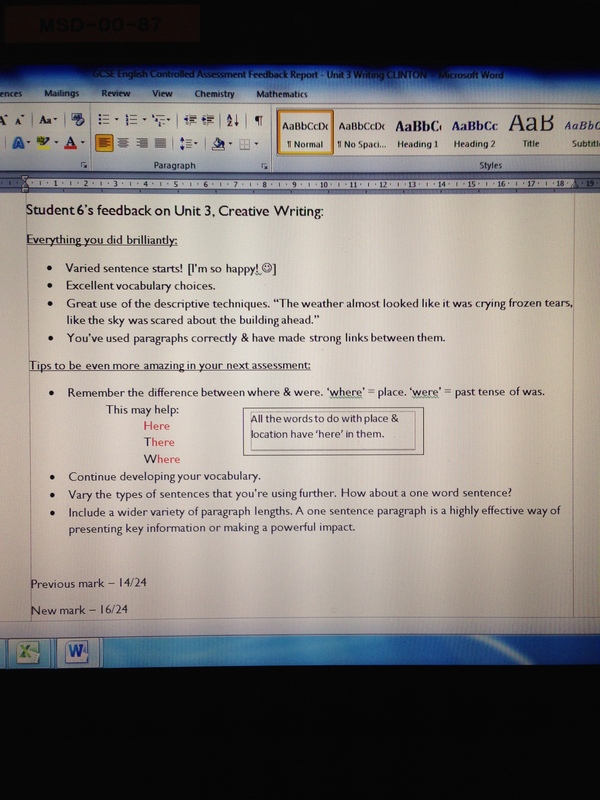 I’m writing this blog as a break from lesson planning, but have spent the whole day getting on with work. As well as coming to terms with the fact that I’m starting on Monday already behind. But more than that, I’m coming to terms with what I’m going to have to do in the next few days. Helping an alcoholic start recovery takes a lot of time and emotional energy from all involved, as does teaching. But I have to choose my actual family this time. There are four of us who are able and willing to help him once he’s out of hospital and that has to be my priority for a little while. And because of that, I’m going to have to do the one thing I really struggle with: ask for help at work. Ultimately family is the most important thing. It’s just as teachers, we’ve an extended family of over 100! 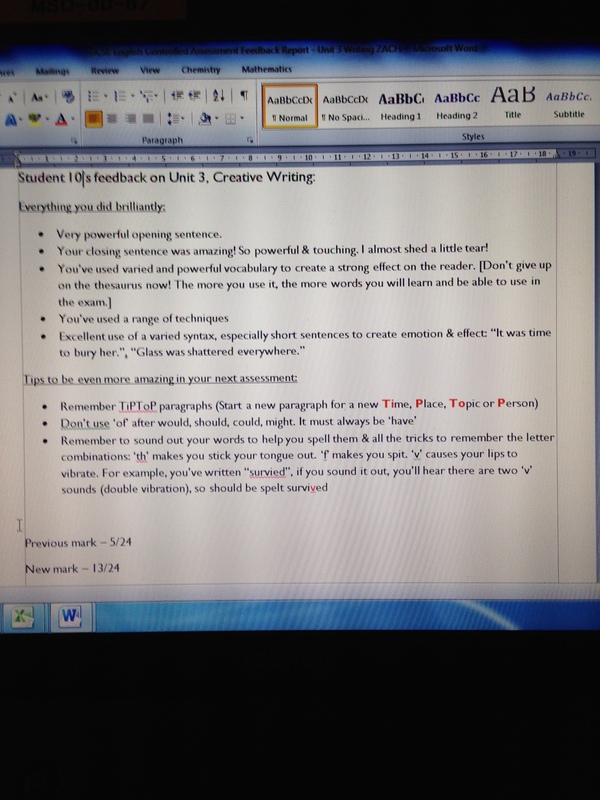 Year 11: Restoring my faith in students, hard work & myself. 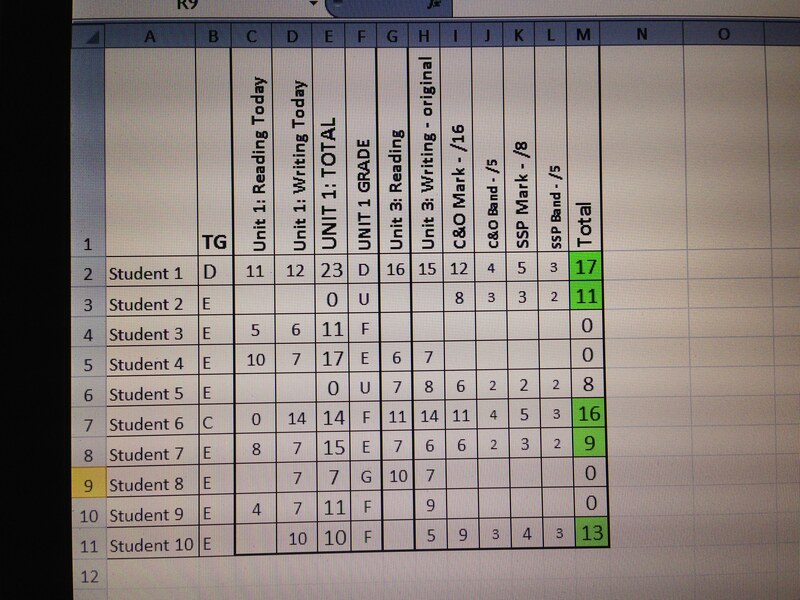 The year 11 class I blogged about a few weeks ago have, finally, finished their first controlled assessment with me. Yes, we are behind schedule. And yes, the process was painful at times. But it’s done now. And what a high it finished on! But it’s more than the higher number which has me so happy, it’s the time and effort they put into this piece of work. It’s their level of pride in their English work: 2 asked if they could take their work home to show their parents, with 1 asking to take it to show to his gran. But it is also the trust they put in me. As I said in my earlier blog, for some I am their 4th or 5th GCSE English teacher. It would have been completely understandable if they had dismissed me as yet another ‘here one week, gone the next’ teacher or just the final straw in a disrupted course. But, to quote the SENCo, they “bought into” me. And until this weekend, I didn’t fully believe that. Friday afternoon was a time of great celebration to me and not because it was the weekend. Stood in the staff room reading out passages from my class’ work to two colleagues had me beaming and bouncing round the room: they were good! And what’s more, it wasn’t my biased judgment which thought this, my colleagues said so too! I may have gotten a little carried away with excitement; possibly scaring my principal and marking on a Friday night, something I NEVER do! However, there was a sobering moment. Student 5. He had only matched his previous mark. I am troubled and saddened by this; he put so much effort in to this piece of work, will this mark dishearten him? I hope not, but it’s down to me to make sure that it doesn’t. And I think I have a plan… As I was reading his work, I realised something seemed wrong: this wasn’t the plan he had written. Mid-way through his writing, he had decided to move away from the plan, I suspect the personal problems he’d had during the week had soured his mood and made his writing more miserable. Task 1 for Monday morning – find out if it’s breaks a CA rule if I let him take a third attempt with his original plan. But how do we move forward? Maintain our new mantra: Each CA needs to be at least one mark higher than the previous. We will no longer settle for ‘good enough’. In fact, we will no longer settle for ‘good’, we want nothing but brilliant. Don’t forget the basics. Reading through their work has reminded me that I need to run over the basics again (and probably again… and again… and again before the exam). They have worked so hard to include all the techniques I taught them and punctuate their speech correctly, but they are struggling with the basics: spelling & sentences. So, I’m busting out my Y7 English Booster resources to go back to basics. It sounds patronising, but I have faith they’ll go with me on it. They embraced ‘sounding it out’ for their spellings. Celebrate. This morning I went out to buy a box of chocolates to share with them on Monday: they worked hard & they deserve a treat. I shall also be calling all their parents / carers on Tuesday (no frees on Monday) to let them know how brilliant their work was (and to tell them about the feedback sheets). I shall also be telling everyone who will listen how brilliant their marks were and asking them to praise them whenever they seem them. But I have better news to share with them – the HoF has OKed pizza! If they get coursework folders of Ds & above they can have pizza on the last lesson, paid for by the department. Oh and for any readers of the previous blog, the Tuesday after school lessons they asked for are still running and I have a steady 3 or 4 turn up each week.